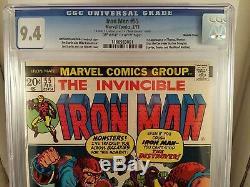 Iron Man #55 Double Cover AND Mark Jeweler/Diamond Insert. 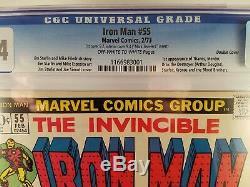 CGC graded 9.4 (inner) 9.2 (outer) OW/W pages!! High grade key with both a double cover and Diamond Jeweler Insert label shows Mark Jeweler, but I believe it was Diamond inserts at this time, was going to have it relabeled, but honestly, I didn't want the book touched again. I'm not even sure where to start. I've seen double covers of this book. Very few Jeweler Inserts, but never BOTH in the same book! I've heard of one being out there, but a much lower grade. Grader's notes are right top corner crunch. " Doesn't look too "crunchy to me, but hadn't considered having it regraded. No idea what pricing to put on this, so I'm putting it out there as a unique collectable, with a chance there is not another one in the world like it. Please ask any and all questions. Packaging will be double boxed, bomb proof packaging. 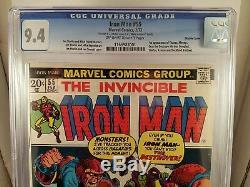 The item "ONE OF A KIND IRON MAN #55 DOUBLE COVER MARK JEWELER/DIAMOND INSERT CGC 9.4/9.2" is in sale since Wednesday, January 2, 2019. 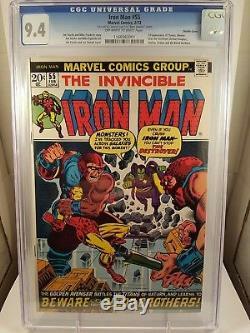 This item is in the category "Collectibles\Comics\Bronze Age (1970-83)\Superhero\Iron Man". The seller is "doubledamage" and is located in Concord, California. This item can be shipped to United States.